How do you know if you are with your soulmate? I am 18 and I am in my first real relationship. How do you know if the relationship will last forever? How will you know if your boyfriend is serious about you? 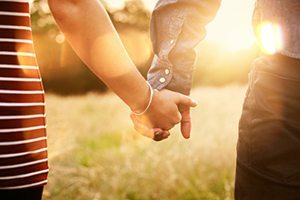 How do you know if you are with your soulmate? You are young and this is a perfect time for you to learn about love and relationships. You are asking a very important question in asking how can you know if a relationship will last? What is involved in making a relationship last? Trying to “know” if a relationship will last in advance sounds like it’s time to call the psychic hotline and get the answer from someone outside yourself. This kind of implies that you have a predestiny model of relationships. They will last or not according to fate. As if you have nothing to do with it — other than to try to find out from the psychic if it will last or not. The reality is that you have everything to do with whether a relationship will last or not. So does your partner, by equal measure. A relationship is not something outside of yourself. There is no such thing as “a relationship” — there is only you — and the other person — and how you relate to one another. If you relate well to one another, and keep growing together as you each continue to grow as individuals, and maintain a good level of positive energy and motivation in being together, then chances are good that you will continue to want to relate with one another. But most people have a part of them that is slightly insecure about the future. That’s an understatement, by the way. So they want to know how it will turn out in advance — especially if they are giving their heart away, so to speak — which really means opening themselves up and becoming more vulnerable to getting hurt if the relationship ends. Now to answer your question. You only know if it will last by seeing that the two of you face your problems together. Most relationships start great. Which is why we want to continue to get to know the other person and hang out with them and let the relationship grow. Yet, after awhile something else comes up. Something a little different than the hearts and flowers that start it all. What comes up? Problems. That’s what. Sorry, I don’t mean to be a pessimist or throw a damp towel on your blossoming love. Nothing to worry about here. Enjoy the honeymoon. Just know that part of the planning for a lasting relationship will also involve some of what I am going to talk about here. And the answer to my question above (“What is involved in making a relationship last?”) is this centered on how you handle those problems. Few people break up because they have difficulty handling the honeymoon. Unless they have severe baggage from past wounds in love — most will respond to the warm sunlight of love as flowers that open and soak it in. What tends to cause relationships to end are problems. They come like cold dark clouds and can eventually seem to block out all the sunlight. All relationships have problems. After the initial honeymoon phase, you will encounter differences between you that are uncomfortable. Or you will meet some insecurities or jealousies. Or perhaps there will be some small conflict. Or a big one. You never know what might come along when two people try to make a relationship work longterm. It’s all fun at first. As it should be. But then later the issues start coming up. So the only thing that will tell you if you are going to stay together is this. It’s about how you face your problems together. Many many people try to run from the problems. Or pretend they are not there. Or think that with enough time or enough love, that will do it. It probably won’t. What you need to do is to stay on top of things and know how to deal with issues skillfully. To know how to deal with problems with skill, you have to develop the skills. This is a perfect time in your life to do that. Longterm love is not a matter of luck. It isn’t even a matter of meeting the right person. And it does not depend on how much love there is. You cannot tell if you will stay together from some psychic reading. Because sooner or later, absolutely all relationships will bring up challenges. You personally must pass those challenges together if it is going to last. You must have a partner who is willing to look at things and work with them — no matter how difficult it is — and they must be willing to continually learn new things to better meet the challenges and keep growing. And, of course, you also have to be willing to do all that.